A hanging holiday garland slowly twisting and turning happy holiday sentiments is always a favorite project to create! 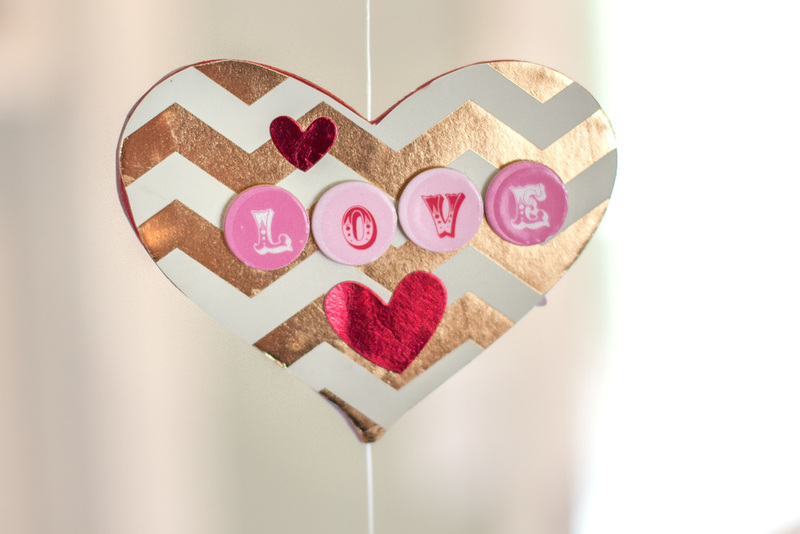 Today me & my BIG ideas has collaborated with Hobby Lobby to bring you this DIY Valentine's Day Garland by Alice Golden. "I love to create decorations for different holidays and seasons. This Valentine's Day garland is easy to make and looks cute hanging from the light over our kitchen table. A few handmade pieces tucked here and there are an easy way to give your home a unique look, plus they are fun to make! SOFT SPOKEN™ stickers and mambiSHEETS are an easy way to dress up these inexpensive wood hearts from Hobby Lobby. I strung them together with fishing line to make this garland." Lightly sand four Hobby Lobby wood hearts (shop here). Paint all the edges of the hearts red. Paint one side of one of the hearts red as well. Using the hearts as a template, trace onto the back of Valentine's themed mambiSHEETS and cut out. Cut the paper with the words 'Truly Madly Deeply' so it is centered on the heart. Ink the edges of that paper with pink ink. Cut the fishing line the length you want the finished garland, adding extra at the top to use as a hanger. Tape the fishing line to backs of the heart-shaped mambiSHEETS to hold it in place, and use liquid adhesive to attach the paper and line to the wooden heart. The fishing line will be sandwiched between the paper and the heart on one side. Apply paper to the other side of the wooden heart. Repeat with the remaining wooden hearts and papers. Do not apply paper to the heart with side painted red. Apply 'Happy Valentine's Day' SOFT SPOKEN™ sticker to the red heart and apply additional mambiSTICKERS to the other hearts as shown. Tracing, cutting, and gluing together! This is a perfect project for crafters of any skill-level to try!